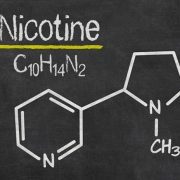 ClyroNic Nicotine has been formulated for the use in E-liquids to bond better with the vast range of concentrates available on the D.I.Y market. CAUTION : 100mg nicotine is a highly concentrated substance and is hazardous undiluted. Please be sure to equip yourself and persons handling this product with the correct Personal Protective Wear. Contains VG , PG and nicotine with a 10% flavour allowance, formulated to level at 70 VG , 30 PG at either 3mg or 6mg Nicotine. For alternative base premixes please contact us.